We woke to very cold wind in the morning, and it turned out to be the theme of the day. Most of it wasn’t fun, but there were some bright spots. I gave Chon a present when we woke up. He had told me that on one birthday, when he was a boy, someone had given him some Oreo cookies, and he had really liked them. I bought him a little pack of Oreos. He was surprised. When we came out of our room to our portal where it’s pleasantly warm, the phone rang. A sister, Chabela called to wish Chon a happy birthday, “But first”, she said, she wanted to rant at him and complain that he hadn’t opened the door to Juana, their visiting sister who came the other day to our little town. We had been dead to the world the afternoon that she came, after a brutal rehearsal in the morning. We hadn’t known about her visit – not that she was coming, and not that she came to visit her sister-in-law, who had suffered a fall and broken a vertebra, (that we also were not informed of). Then María called to say happy birthday, and that – just like that – she had done her duty. Chon is very sensitive to these things (attacks? and opinions), and he felt hurt and angry. We got to work. We hadn’t carried even one of our many speakers and other equipment to the stage. No a surprise. We’re both procrastinators. The plan had been to begin to move the biggest equipment on Wednesday. It proved difficult to stick to the plan. We began in the cold, windy morning. We took things one or two (or four) at a time, resting in between. Other times we had peónes to help. Not this time, and it was to prove disastrous, to me, anyway. About noon or later, all the equipment was up there except for my keyboards and various cables. A niece, Nena, daughter of Elena, Chon’s sister, had said she would come at 1:30. But she didn’t come, and I worriedly began to prepare some things for the food for the guests. Later we’d find that she had had to make a trip to San Francisco, to sign papers for the family’s health insurance. 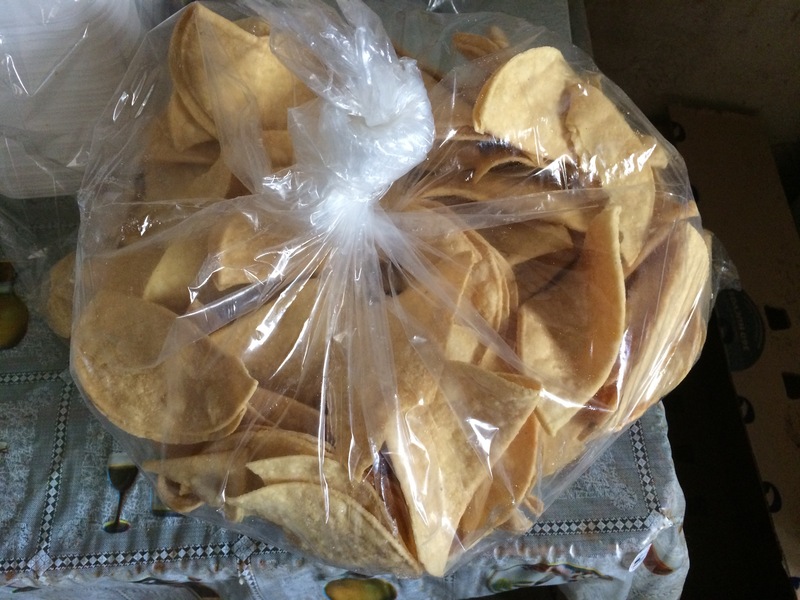 Tacos de aire, a charming name for a way to serve folded, crispy tacos (you can buy them prepared, in large sacks). All you have to do to serve them is top them with liquified beans flavored with some garlic (important! ), shredded lettuce and/or cabbage, salsa (the eater’s choice of red or green), and a lovely cream (thinner than sour cream). Tacos de áire, “air tacos” – no meat – gotta love the name! Hot chocolate. We bought a big container of Nestle, which is to be prepared with milk. We sampled some made with only water, which was “OK” to us. I thought people would probably like it just like that (chocolate is a luxury here). Cake ( to be brought by a friend, Sarita). For the tacos de aire I wrote earlier “all you have to do is” to make the tacos de áire, but that involves preparing the beans (think a couple of gallons of “bean dip”), making the salsa (a couple of quarts of each), shredding the lettuce and cabbage, and having the cream on hand. (Sarita told us about a very good cream that she likes, brand “Aguas Calientes”). So I was in the kitchen, making quarts of salsa and cooking beans. Chon was on the stage, setting up. But when I went out to see how he was doing, he was resting, and thinking that nobody would come to the party, because it was so horribly windy and cold. He didn’t do much to make all the electrical connections. He seemed shocked and upset about the weather. (And the earlier calls from his sisters). The stage still wasn’t set up, and I kept working, starting the water for chocolate heating, helping in the kitchen, carrying gallons of dish-washing water from the faucet outside, and generally keeping up. Nena told me the chocolate would be better if we added sticks of cinnamon and some bags of specially prepared finely ground corn for “atóle”, a hot Mexican drink based on corn and flavored with a dazzling array of flavors to select from. That turned out to be a good decision. It made the chocolate thicker and tastier. You may feel sceptical, but it turned out really well. I liked it, and I’m a bit picky about chocolate. It had enough chocolate flavor, and it was thicker than “regular” hot chocolate. Very tasty! Nena continued in the kitchen, making the thick, “smearable” beans from the beans I had cooked earlier, and the red salsa (she said the green salsa I had made was good – yay! – the first time I made a large quantity of salsa – I just used a much larger quantity of jalapeños than I would have made for myself – about 3 times as much, haha). The stage still wasn’t set up. We carried my two keyboards over there, and set them up on the stand, but the cords still weren’t connected. A few people trailed in – a friend Paty brought several relatives, and they sat waiting in the cold. They waited and more people came, and waited. Chon spent quite a bit of time teasing the flock of kids that had come in through the open doors. It seemed that he wasn’t at all concerned about getting the music equipment working. No sound check. No nothing. I’m not sure what time we began to play, but I think it was around 9. It took a long time to begin after we LOOKED like we were ready to start. The amplifiers and the head still were not communicating. Un-technical music comments follow: when the sounds began to come, I could hear my keyboards, and I could hear the guitar, coming from different speakers. There was little volume from the drums, a dangerous thing – you can get completely lost if you can’t hear in particular the bass drum. But Chon couldn’t hear the drums at all on his side of the stage, and he turned the volume way up. On my side of the stage I could hear sound from the drum machine that I had never heard before – offbeats with treble-ish high sounds. Extremely confusing and excruciating. Chon’s exquisitely-tuned ears weren’t hearing the same things my exquisitely-tuned ears were hearing. In several instances we weren’t playing the same chords, or even in the same key. It was horrible. It did get better, but we only played about a tenth of our set list. It simply was too cold. My fingers felt stiff and clumsy. About half of the invited guests had gone, and a few die-hards were asking for special songs that they loved, so we were reluctant to stop. At one point I did get off the stage quickly because one small boy was throwing rocks at the dove nest in our big pine tree. I was unpleasant, and so was he and his two friends (all uninvited). The cake Sarita brought was very, very good. A favorite cake in Mexico is “trés leches”, made with a basic white cake, soaked with “three milks”, all canned, I think. It’s served at nearly all celebrations – something you have to get used to, and for me, still not a favorite. 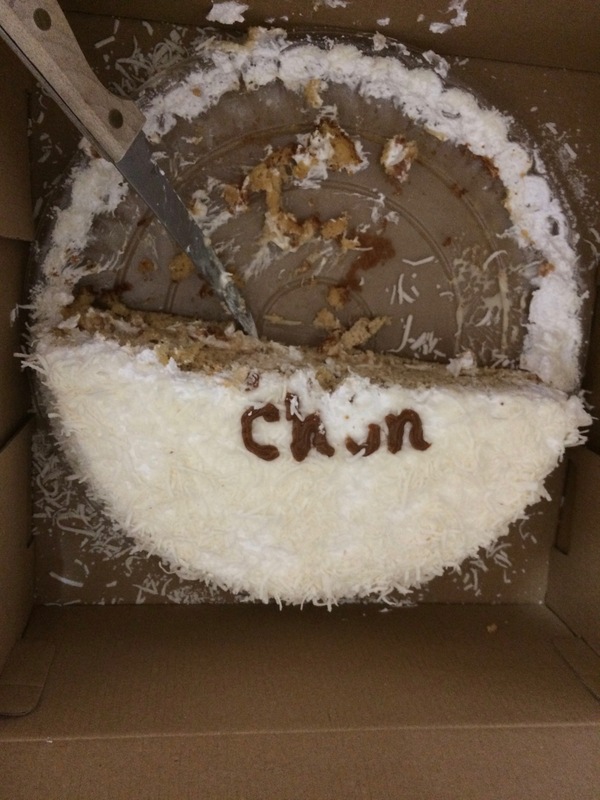 The cake Sarita brought was also the “trés leches” style, I but it wasn’t overly wet – a very moist white cake (I think it may have had some whole wheat flour in the mix) completely covered with roughly grated coconut – delicious! and with cajeta, a caramelized milk syrup, between the layers. It was wonderful. Nena’s family stayed around afterwards in the cold, to chat about plans for the next harvest (her husband drives a tractor for us). It was a day that was unsatisfactory in some ways, and pleasurable in small ways. one container of Nestle’s chocolate powder, 20 liters of water – mix into milk two bags of maizena, a type of corn starch, used for champurrado and atole. This entry was posted in farming in Mexico, gringos in Mexico, performing musicians, rancho life in Mexico, retirement in Mexico, small town life in Mexico, Uncategorized on December 9, 2017 by gubabbaboy.